In an emotional speech at the prime minister's office, she said it had been her dream to return "without any fear". Details of the surprise trip are being kept secret for security reasons. Pakistani television broadcast video showing her arriving with her parents at Islamabad's Benazir Bhutto International Airport under tight security. "Always it has been my dream that I should go to Pakistan and there, in peace and without any fear, I can move on streets, I can meet people, I can talk to people," Ms Yousafzai said in a televised address from the PM's house in Islamabad. "And I think that it's my old home again... so it is actually happening, and I am grateful to all of you." The trip is expected to last four days. Officials from her Malala Fund group are travelling with her, local media report. It has not been confirmed if she will visit her family's home region of Swat in the country's rural north-west - once a militant stronghold - during her visit. Many on Twitter called for a warm welcome for the activist after news of her overnight homecoming broke. Malala's return would have been unthinkable until a couple of years ago, but security is improving after years of Islamist violence. Her coming back sends a positive message. These days Pakistan's powerful army is keen to demonstrate that life is returning to normal. Malala knew the longer she stayed away, the more ammunition her critics would have to target her. Although the majority here support her, many in Pakistan's patriarchal society still question her credentials as a campaigner for girls' education. Conservative men who target her online hate her for following what they see as a Western agenda of female emancipation. For them, women getting an education is daunting and dangerous, especially in rural areas, where millions of girls drop out of school and end up doing household work. So Malala is up against a difficult male mindset. She later became a vocal advocate of female education amid militant suppression in Pakistan, and was deliberately attacked on a school bus at the age of 15. Malala's story brought international attention. The Pakistani Taliban said at the time that they had shot her because she was "pro-West" and "promoting Western culture in Pashtun areas". After receiving emergency treatment at a military hospital in Pakistan, she was transported to the UK for further treatment and to recover in Birmingham, where her family continue to live. What has she done since? Since her recovery, Ms Yousafzai has continued to speak up for children's education and rights around the world. She set up the Malala Fund with her father Ziauddin, with the goal of "working for a world where every girl can learn and lead without fear". 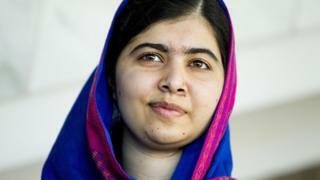 In 2014 she became the youngest person to win the Nobel Peace Prize. She and Indian activist Kailash Satyarthi were jointly awarded it for their efforts for children's rights. She has continued campaigning while pursuing her studies, and is now studying at Oxford University. Despite security efforts in recent years, the Pakistani Taliban has remained active. They have been blamed for a number of deadly attacks on schools and colleges that have killed hundreds. Ms Yousafzai repeatedly expressed her wishes to return to Pakistan, describing her hometown of Swat as "paradise on earth" in an interview earlier this month. "I have received a lot of support in my country," she told US talk-show host David Letterman in a Netflix special. "There is this lust for change. People want to see change in their country. I am already doing work there but I want my feet to touch that land." Pakistan is religiously conservative and late last year Ms Yousafzai was trolled online after a picture of her in Oxford wearing Western clothes - jeans and heeled boots - was shared on social media. In 2015 a Pakistani court jailed two men for life for involvement in the attack on Ms Yousafzai. Eight others were acquitted. The man named as the chief suspect is still on the run, the authorities say.